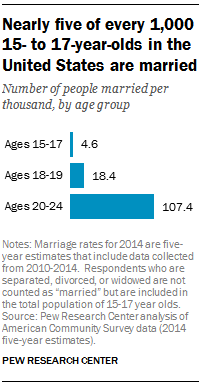 About 57,800 minors in the U.S. ages 15 to 17 were married as of 2014. That might sound like a lot of people (and it is), but it’s also just five of every 1,000 in that age group, a Pew Research Center analysis of 2014 data from the Census Bureau’s American Community Survey finds. By contrast, 18 of every 1,000 of those ages 18 to 19 were married, and among those ages 20 to 24, the number rose to 107 out of every 1,000. The rate of child marriage varies widely by state. It is most common in West Virginia and Texas, where about seven of every 1,000 15- to 17-year-olds were married in 2014. Several other states in the South and the West, including Oklahoma, Arkansas, Tennessee, North Carolina, Nevada and California, also have above-average rates of child marriage. 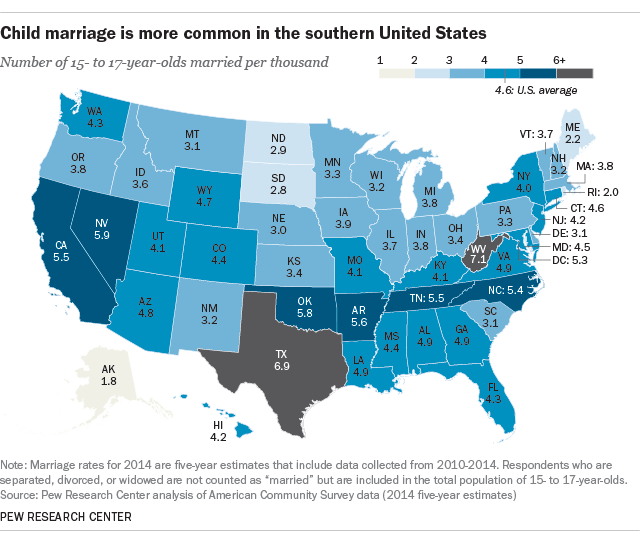 Marriage among 15- to 17-year-olds is less common in the Northeast and the Midwest. In Maine and Rhode Island, for example, only two of every 1,000 in this age group were married that year – less than half the national average. The same was true in Alaska. A handful of states allow minors to marry if one partner is pregnant or has recently given birth. For example, in Florida, judges may issue licenses without an age minimum if one of the parties to the marriage is pregnant. 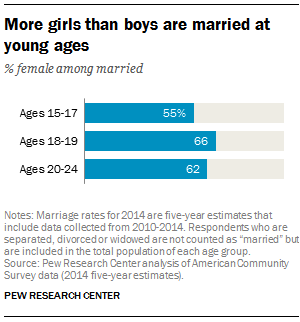 Of the 57,800 Americans ages 15 to 17 who were married in 2014, an estimated 31,644 were girls and 26,156 were boys, with 55% being female and 45% male. (Texas has the highest child marriage rate for girls: Nine out of every 1,000 girls ages 15 to 17 in that state were married.) Gender differences are even wider at older ages: Among married young adults ages 18 and 19, 66% were female; among those married and ages 20 to 24, 62% were female. The American Community Survey is one of the largest and highest quality surveys available, which makes it ideal for examining rare events such as child marriage. However, estimates of child marriage are subject to accurate reporting by survey respondents. To the extent that some people may be less willing to say that they (or a household member who is ages 15 to 17) are married, this analysis could underestimate the prevalence of child marriage in the population. David McClendon is a research associate focusing on religion research at Pew Research Center. Aleksandra Sandstrom is a copy editor focusing on religion at Pew Research Center.